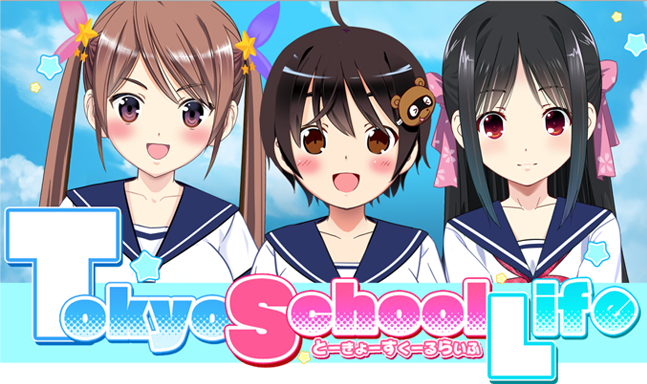 Tokyo School Life is a visual novel game released on Steam by Dogenzaka Lab and developed by M2 Co., Ltd. The same staff who created M2’s 2D animation system, E-mote, and M2’s multi-platform novel engine, “Kaleido ADV Workshop”, took part in the development of this title. Tokyo School Life is a comical yet romantic visual novel game about a boy with an interest in Japanese subculture who ends up living together with three very unique girls during a short term study abroad in Japan. The developers of the animation technology E-mote helped bring this project to life by providing an abundance of rich and expressive movement to the characters. The smoothness of the animation almost doesn’t seem like it could come from a 2D illustration, and also very vividly expresses the characters’ emotions. In addition, the know-how gained from the production of this game will provide useful feedback for the further development of the E-mote software. The E-mote software animates 2D illustrations so smoothly that they almost appear to be 3D models with a myriad of expressions. However, there’s no need to create a 3D model – the 2D illustrations can be animated “as is.” The fine details and stylistic touches of the artwork can remain as the character comes to life. Characters created in E-mote are compatible with PCs, smartphones, and a wide range of game consoles. Currently the E-mote software and website are only available in Japanese, but an English version is in the works! To keep up to date on the details of the English release, please follow the official English language E-mote twitter. Kaleido is a multi-platform visual novel game engine. It’s multi-use from a single source, making it possible to release your creation on multiple platforms simultaneously, including PCs, smartphones, and many different game consoles. It has full support of E-mote, so you can express an endless amount of character emotion.